FORT WORTH, Texas (Sept. 25, 2015) – A Big 12 instate showdown and a Pac-12 top-25 clash have been selected as the Davey O’Brien National Quarterback Award’s Marquee Matchups for the fourth week of the college football season. In the first game selected, TCU’s Trevone Boykin, a 2014 award finalist, and Texas Tech’s Patrick Mahomes will meet in Lubbock, Texas, on Saturday afternoon. The nightcap features UCLA freshman Josh Rosen traveling to Tucson, Ariz., to face Arizona, led by 2015 Davey O’Brien watch list member Anu Solomon. Throughout the season, the Davey O’Brien Award highlights the best weekly quarterback matchups as the race for the oldest and most prestigious national quarterback award continues. 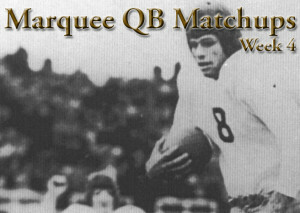 Fans are invited to help select the Marquee Matchups each week by voicing their opinions on Twitter at @DaveyOBrien using #MarqueeQB. Quarterbacks from all 128 NCAA Division I Football Bowl Subdivision schools are eligible for the Davey O’Brien National Quarterback Award until the field is narrowed to 16 semifinalists on Monday, Nov. 2. The three finalists will be named on Tuesday, Nov. 24, while the 2015 Davey O’Brien winner will be announced on The Home Depot College Football Awards airing Thursday, Dec. 10 on ESPN. Trevone Boykin, the reigning Co-Big 12 Offensive Player of the Week, was an honorable mention Davey O’Brien Quarterback of the Week after accounting for 504 yards and six scores against SMU. He currently is listed among the nation’s top six in passing touchdowns (T2nd, 10), points responsible for (T4th, 72) and total offense (6th, 377.7). Patrick Mahomes, already a two-time Big 12 Offensive Player of the Week in 2015, leads the 3-0 Red Raiders, who are averaging 54.3 points per game. The sophomore ranks tied for second nationally in points responsible for (78), fourth in total offense (386.0), sixth in passing touchdowns (9) and seventh in passing yards (1,029). True freshman Josh Rosen makes an appearance on the marquee list for the second straight week. He was named the Davey O’Brien Quarterback of the Week following his collegiate debut in which he was 28 of 35 for 351 yards and three touchdowns. Rosen has guided the Bruins to a 3-0 start and a top-10 national ranking. Sophomore watch list member Anu Solomon has thrown for 778 yards and 10 touchdowns with no interceptions during Arizona’s 3-0 start. His 10 touchdown passes rank tied for second nationally, while he is sixth in points responsible for (66). Last week, Arizona set new single-game school records for total offense (792 yards) and points (77).